On August 13, 1977 Dave Trowbridge and I sat down at his cool little carved table, with wine and other substances to inspire us, candles to write by, and began the Exordium saga. What a long, strange trip it’s been! In 1980, it was a six hour mini-series that very nearly sold to HBO. Our ‘elevator pitch’ for our five-book space opera: Exordium is a cross between Star Wars and Dangerous Liaisons with a touch of the Three Stooges. Revised with added material in this edition. Brandon nyr-Arkad, dissolute youngest son of the ruler of the Thousand Suns, abandons the life of Service planned for him and flees into the lawless Rift. Only slowly does he discover that the world he rejected now lies in smoking ruins as the ritual vengeance of Jerrode Eusabian against Brandon’s father, twenty years in preparation, culminates in an explosion of interstellar violence. 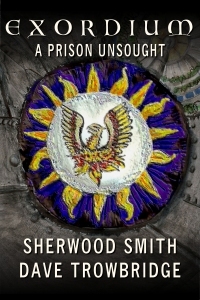 With both his brothers dead and his father the Panarch imprisoned, Brandon becomes the Panarchy’s last hope. 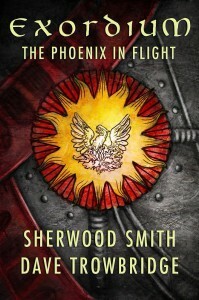 In the sequel to The Phoenix in Flight, Brandon vlith-Arkad, who fled the Mandalic Palace and his old life only hours ahead of assassination, is now heir to the Panarchy. 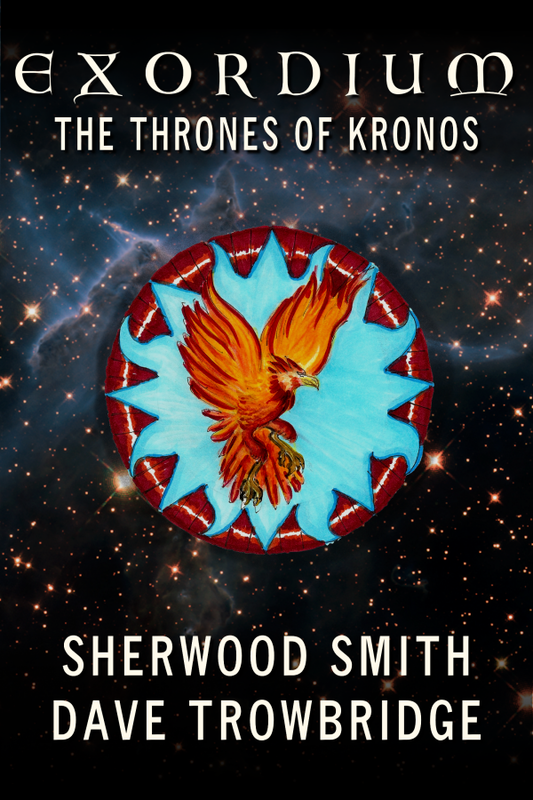 He wants only to rescue his father, the Panarch. But everyone wants a piece of him. The Dol’jharians, who smashed the Panarchy and took his father prisoner. A Rifter pirate and her crew, who helped him escape a doomed planet–twice–and now wonder what to do about a royal prisoner with the price of ten planets on his head. And the remnants of the government of the Thousand Suns, for whom he’d at best be an inconvenience. And that’s before things go seriously pear-shaped. Racing ahead of the light-speed news of their attack with FTL comms and weapons looted from a fortress built millions of years ago, the Dol’jharians and those Rifters allied with them are consolidating their victories. Elements of the Panarchist Navy struggle to understand what’s happening, find surviving units, and strike back. And Eusabian of Dol’jhar, now master of the Mandala from which his defeated enemy once ruled the Thousand Suns, awaits news of the Heart of Kronos, the missing key to ultimate power. Which lies in the hands of Brandon’s captor. The chase is on, and unexpected detours await. Completely revised, with new material added since its publication in the nineties, this is the third volume of Exordium.. This swashbuckling space opera continues with Brandon and the Rifter crew of the Telvarna arriving at the Panarchic Navy’s headquarters. 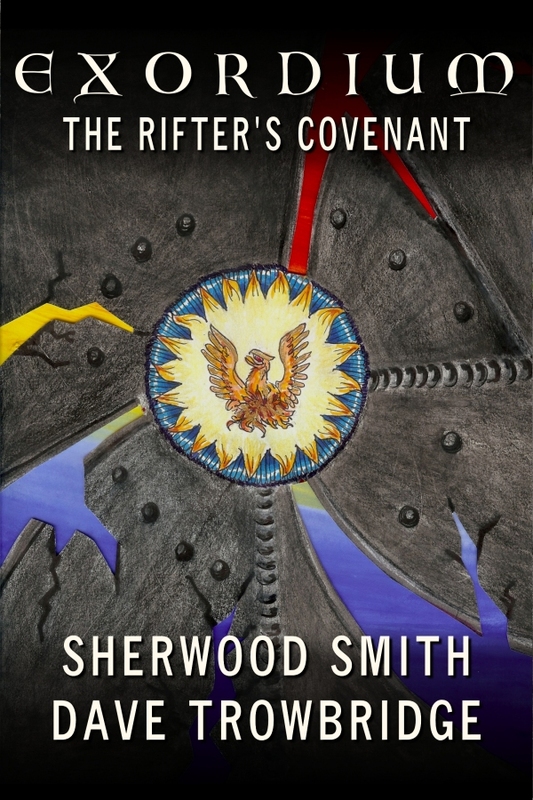 The Rifters are imprisoned, and Brandon finds himself, as sole heir to the Phoenix Throne, fighting a battle of symbols, his only weapon his wits as he strives against the powerful and sophisticated aristocrats who hide lethal intent behind urbanity and style. 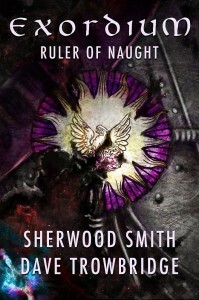 His goal is to win back control of the Navy and rescue his father from the vicious end planned for him by the usurping Doljharians, resulting in a race to the harsh planet of Gehenna. Completely revised, with new material added since its publication in the nineties, this is the fourth volume of Exordium.. The Panarchy is in shambles, coalescing at the military base Ares. Brandon has inherited not only this political tinderbox, but also must face the escalating threat from the invading Dol’jharians and their Rifter allies before they can power up the ancient artifact they call the Suneater. But moving with secret, deadly precision against Brandon is a traitor who will do anything for power. Meanwhile Brandon has fallen in love, but everyone thinks it’s with the wrong person. Space battles, political in-fighting, and personal struggles ramp up the stakes in this penultimate volume in the five book Exordium series. Completely revised, in this last volume the desperate fight to recover the Panarchy of the Thousand Suns is about to commence. Brandon hai-Arkad has been crowned Emporer, but his throne remains in the hands of his enemy, Jerrod Eusabian of Dol’jhar. The fleet has been gathered, the order of battle drawn. Brandon will reclaim his father’s empire, or face annihilation. This is the exciting conclusion to the Exordium series. We talk about the process of writing and rewriting at John Scalzi’s Big Idea. If you’d like to see the Exordium Webpage (which goes into the game designed by Christopher Weuve and Arius Kaufman) click here. For anyone interested in the collaboration and creation process, here are snippets of e-mail.